For 36 years, Grave Digger has been grinding out "keep it true" classic heavy metal. That's nearly a Biblical generation. Healed By Metal, believe it or not, is their eighteenth album in a long career. Grave Digger sounds in fine form with apparently no thought of slowing down. The thing about classic heavy metal is that you know it as soon as you hear it. 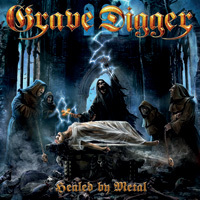 Similarly, with Grave Digger when you hear founding, only original member, and vocalist Chris Boltendahl raspy gravel, yet melodic, voice, you know it's Grave Digger. Toss in the large, brisk, and harmonious riffage, the ripping solos, the thundering rhythm section, and essential hard rock groove, and all your expectations are fulfilled. If anything Grave Digger is consistent and true to their craft. As they chant in the refrain within Ten Commandments Of Metal: "Stay true!" As for the songs, Grave Digger basically sticks to their tried true formula: the three minute heavy metal song in tour-de-force fashion. There are no wasted notes, no unnecessary elements or embellishments. Turn on the guitar and vocal harmony, melody, groove, and then drop in some lyrical hooks from catchy refrains and gang metal shouts. The formula is perfect within the aforementioned Ten Commandments of Metal, but also Call For War, When The Night Falls, and the uber-catchy Healed By Metal. 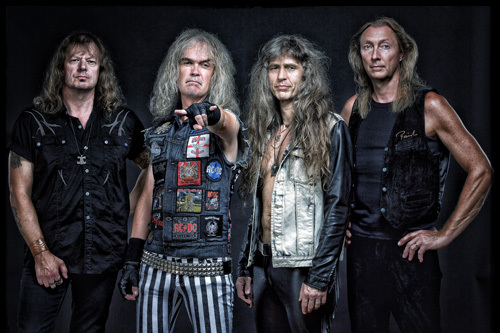 Additionally, Grave Digger revisits their earlier speed metal roots with The Hangman's Eye and Hallelujah. Also, listening to the opening riffage of Free Forever, you'll think you hearing an homage to Judas Priest. 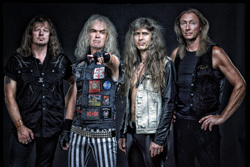 Fundamentally, as stated earlier, Healed By Metal is classic Grave Digger, consistent and true to their classic heavy metal vibe. Recommended. Fundamentally, Healed By Metal is classic Grave Digger, consistent and true to their traditional melodic heavy power metal vibe. Stay true! Recommended.